— blocks viruses and malware from accessing the protected system and will cure the malignant programs that have already penetrated it. — will shield against the latest active threats, targeted attacks and attempts by Trojans and exploits to penetrate a system via zero-day and other vulnerabilities. — detects spam and other unsolicited messages in any language, with next-to-zero false positives. — an HTTP monitor that scans webpages in real time, blocks phishing websites and other dangerous web resources, and protects against miners. — blocks access to websites by URL keywords and protects children from exposure to objectionable web content. The “restrict access” feature protects information located on removable data-storage devices and in files and directories from unauthorised access, theft, and deletion. — an impenetrable barrier to hackers attempting to break into your system. component, you can remotely control Dr.Web anti-viruses installed on computers connected to one local network. Detects the latest threats in real time regardless of how current a computer’s Dr.Web virus definitions are. Simply enable this feature so that even if a Trojan encodes your files, you will be able to restore them on your own without having to request support from Doctor Web. Unlike conventional back-up programs, Dr.Web creates backups and protects them from intruders. Use this feature to prevent removable media (flash-drives and any other USB device, including webcams, cameras, and portable media players) from accessing your computer and keep Trojans out. No services for Windows are available under the Dr.Web Anti-virus license. Implement a company-specific security policy without having to configure each PC’s protection components. Ensure that employees cannot disable the anti-virus or its separate components, which would inevitably reduce the level of protection. Ensure that the anti-virus operates with the settings specified by the network administrator. Schedule and remotely run regular scans, both on administrator demand and according to a schedule. Monitor the regularity of updates and ensure that they cannot be disabled. Collect and analyse information on the health of the anti-virus protection system, and generate reports for a specific timeframe. Notify administrators and users of the protection system’s health status. Timely respond to emerging virus problems, which will lessen the risk of network infections and company financial losses caused by personnel downtimes, data losses, Internet connection breakdowns, and business partners being impacted by your infection issues. force background scanning on protected hosts. Identify computers on the network that aren't protected by anti-viruses. Install Dr.Web remotely onto target computers, for example, by means of Active Directory services. The Network Scanner searches for computers by IP address in the local network and generates a hierarchical list of computers, indicating which of them have anti-virus software installed on them. Group installer — easy deployment on remote objects with a local network. Configure the Dr.Web component update procedure on protected workstations by distributing the load at different time intervals. Monitor virus databases and the status of the PCs. Apply the update settings of one station to another station or to a whole group (or groups). Take advantage of the mobile mode so that the machines of employees who work off-site remain protected. Lower traffic usage in high-load virtual environments and low-quality bandwidth situations. 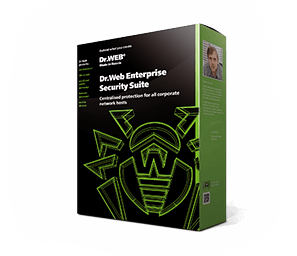 Dr.Web Enterprise Security Suite can be updated as before, using special utilities, and Dr.Web Proxy-server's cache can be updated manually, from the Dr.Web Server repository in particular. Start/stop scanning on remote hosts without interfering with the user experience. Specify any necessary group and individual scan schedules, i.e. scan the system at a time convenient for employees. The restriction of access to removable devices is centrally configured in the Dr.Web Control Center. Define the files and folders on the local network to which an employee may have access, and prohibit access to those that are off-limits. This prevents data and sensitive information from being deliberately or intentionally damaged, deleted, or stolen by attackers or insiders (i.e., employees seeking access to confidential information). Restrict or deny access to websites and removable devices, and therefore, exclude the possibility of a virus invading via those sources.